We are still in an epic year for rainfall and it seems like the pattern has not stopped for months. Among the most popular questions I have received relate to where we stand with records for the wettest year and will this carry over and bring us a snowy winter. There are many other factors than just a wet pattern to consider, but I wanted to share a look at just the stats on rain and winter snow as they may relate. 2018 is the year of the history flood in Ellicott City. 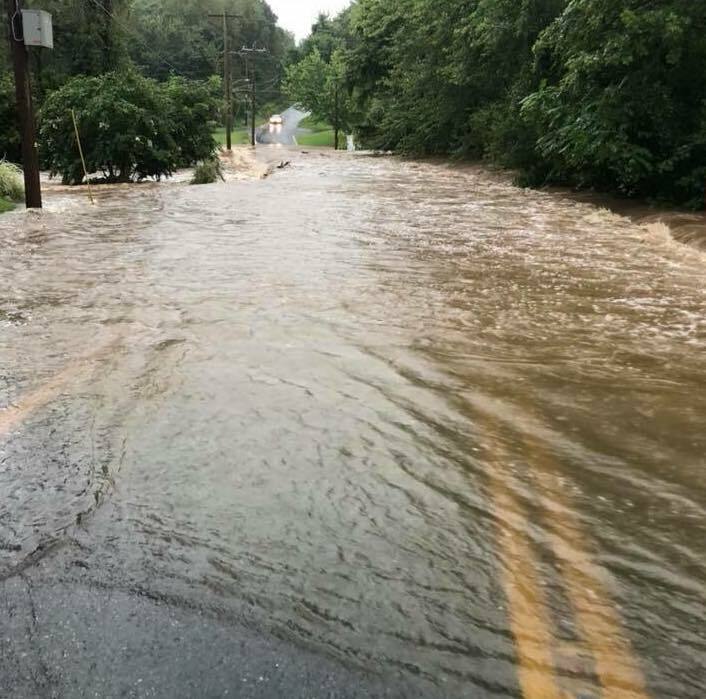 There have been numerous floods in Harford County, extensive debris floating down the Bay, and routine high water/ flooding in Annapolis. We came out of somewhat dry winter with one real region wide storm in March. This brought us into a wet spring the unloaded with rain in July. That was a month with two individual daily rainfall records and blowing the monthly record away. Meteorological records cluster seasons into three month groups. Spring is March, April, and May. Summer is June, July, and August. 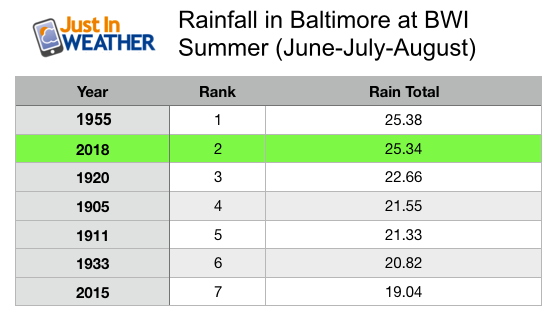 The entire summer ranked second wettest on record in Baltimore, just missing the top spot by 0.04″. Spring was about half of the normal rainfall. Summer just barely missed the wettest all time. 1995 still owns that spot. This is not the wettest September. There is about a four inch cushion separating the top September in 2011. There are two dry days ahead to end the month, so it looks like that record is safe. 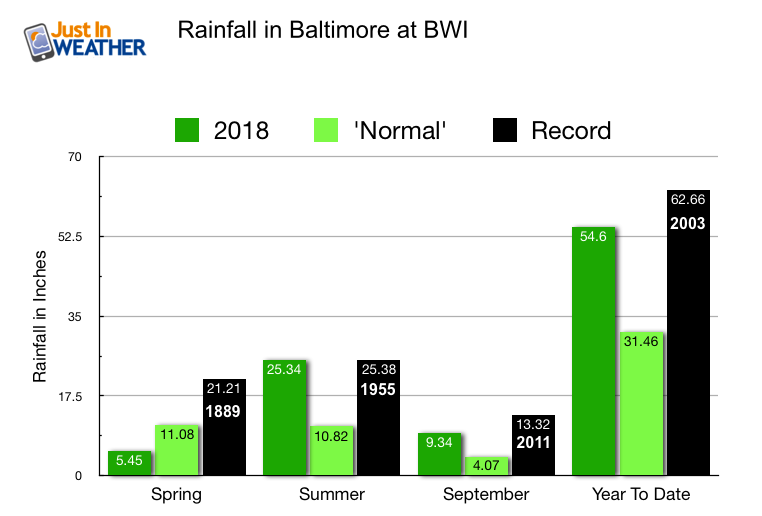 The wettest year on record in Baltimore was 2003. That included the third snowiest winter, top 20 summer rain, AND Hurricane Isabel in Fall. 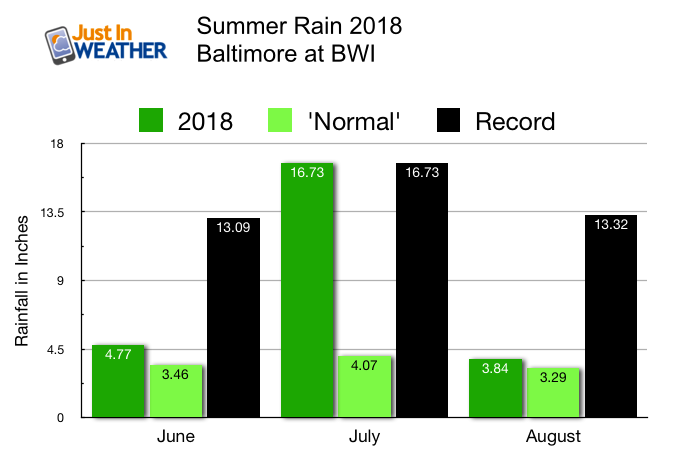 Baltimore would need eight inches of rain in the next three months to approach that mark. For argument and simplicity sake, I groups the wettest summers with 19 inches or more rainfall since 1883. That is to compare to the length of our snow records. 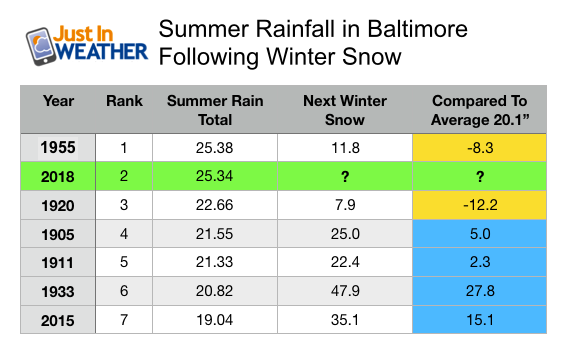 Removing the 2018 summer, since we do not know yet, here is the snowfall recorded in Baltimore over the following winter. The list is ordered on ranking from wettest summer on top. 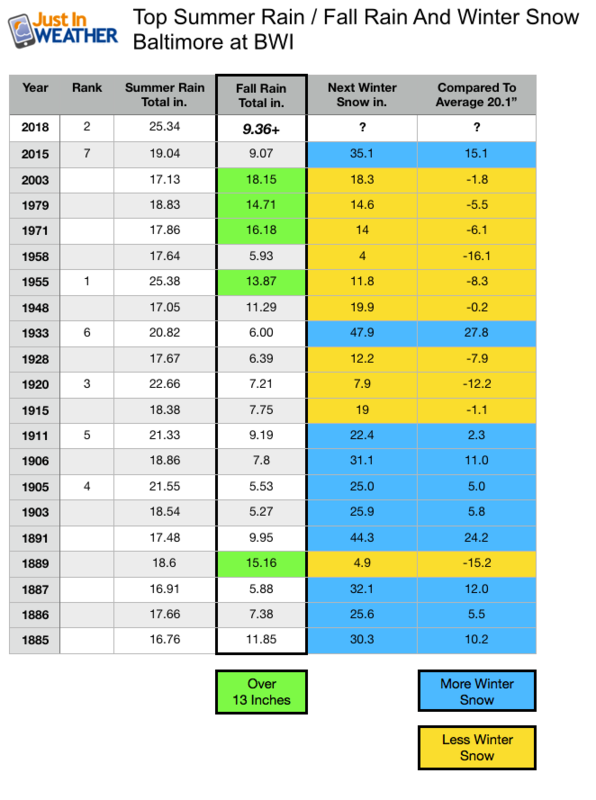 Four of the six remaining winters on the list ended up with above normal snowfall, over 20.1″. On the surface, that would suggest a 67% chance for a snowy winter. But this is a very small sample size… Please scroll down for an expanded list. 2018 only includes the preliminary rain up through Friday morning September 28. So far, we have recorded 9.36″ rain to date. The entire Fall season lasts through November 30th. That is valuable information if you want snow. Statistically speaking… This larger cluster of years with wet Summers don’t always follow with a wet Fall. But, when Fall is very wet, the following winter has less that average snowfall. This sample showed Fall seasons with over 13 inches of rainfall, the following Winter was overwhelmingly likely to have low snow. Note: 2003 had more snow starting the year. That prior winter had 58.1 inches of snow, but this chart shows the winter following that wet summer and was just below the average snowfall for winter 2003-2004. These statistics are only raw numbers. I did not account for prior hurricane season tracks, North Atlantic Oscillation, El Nino/ENSO status, or other factors. But to answer the question about a wet summer meaning a snowing winter… Not exactly. In fact, I would suggest that if the wet pattern carries form Summer to Fall, then a drier pattern is more likely to follow that winter. But if the elements that impacted the jet stream relax for us in Fall, then we have a better chance for it to snow more this winter. If you want more snow, then you will want to cheer on a very dry pattern to develop in October and last through November. That would hold down the already high start to the seasonal rain. As much as I love snow, I can’t skip ahead of the Fall season. We do need dry weather to try and salvage some foliage viewing, or mold and degradation of the leaves will not help. My complete Winter Outlook should be ready later in October. It is still too early for all of the patterns I assess. FITF Store will reopen the first week of October. I think it is early, but I have had a lot of requests for gear and SnowStix.